In 2015 Craig Cunningham named Atins as his #4 favourite flatwater spot in the world. Located 600km west of Fortaleza, Atkins serves as an endpoint for many legendary downwinders. Set in the Delta of the River Preguiças the meandering river mouth creates ever-changing sandbanks and knee-deep lagoons. 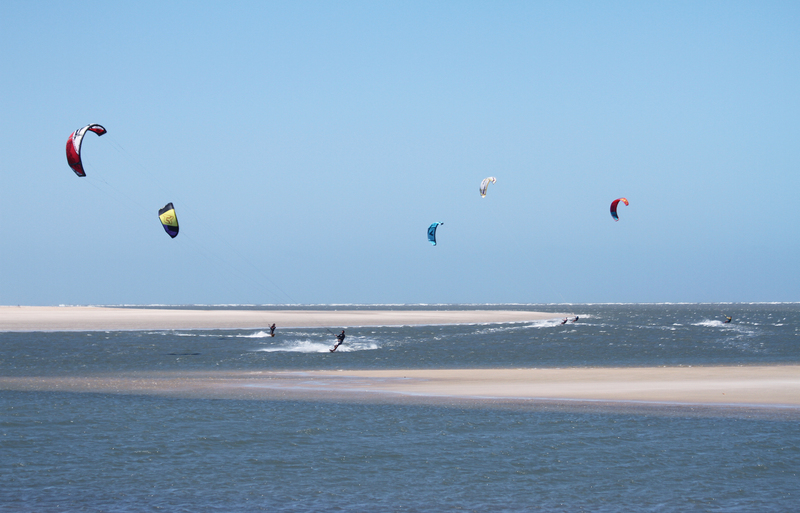 Along with its consistent strong winds, typical for these shores, kiters encounter perfect conditions in this part of the world. But Atins has even something more to offer! The village sits right at the entrance of the magical Lençóis Maranhenses, a unique landscape that mixes white dunes with rich underground water supplies, in itself a truly extraordinary spectacle to be experienced, even more so by kite! Between July and December, kiters will find ideal conditions in Atins. During this time the vast and sparsely populated beaches are met by constant cross on-shore winds of 15 to 30 knots. In Atins you won’t find streets or any conventional pavement; here life sets place in a large sandpit. Since the village is fairly spread out, distances to and from the beach can become physically demanding when walking in deep sand. Quad taxis are starting to emerge, as a kiter, however, consider staying at a pousada close to the beach. Atins is the perfect location for beginners and pros alike. The Lençóis Maranhenses National Park is quite extensive and has no access roads. Because of the nature of the park’s protected status, only specially licensed vehicles are permitted access. Entrance to the park is made exclusively by 4-wheel drive trucks. When planning your trip to Atins some thinking ahead might be sensible. The schedules of the means of transportation for the various sections are not fully aligned, and you might experience some unwanted downtime in Barreirinhas when missing the connecting 4-wheel truck or boat. For full, detailed and updated instructions on how to get to Atins go to Atins.me. There are some restaurants, most of them offering local cuisine with a few Italian and pizza places thrown in for good measure. The signature dish for Atins is camarão (prawn). The two restaurants of Luzia and Antonio in Canto do Atins (a ½ day trip to the National Park) serve the most original dishes of those local delicacies. Life in Atins remains simple. Visitors expecting levels of nightlife resembling perhaps Jericoacoara might be disappointed. Atins today is more like Jericoacoara, Praia da Pipa or Trancoso were about 20 years ago – very tranquil and chilled out. The Wind comes almost guaranteed from July to mid-January. In case you should come across an extremely rare no or low wind day, go and check out the famous Lençóis Maranhenses. It's an experience not to be missed! If you're addicted to water, there's always SUP, fishing or finally relaxing in the hammock! Check out http://www.atins.me for more options and details. The Internet is not accessible to come by in Atins. There are two options: firstly, use of the internet through the mobile network where available, or second, there is a single Internet Café at the sempreAtins travel agency near the entry of the village. There is a growing number of options for accommodation in Atins, from cheap & cheerful backpacker hostels to luxury boutique pousadas. A couple of places specialise for kiters, one of them being the Convento Arcádia, just 100m from the beach with purpose-built kite facilities. For a complete overview of accommodation choices check-out http://www.atins.me. Competitors perform at Red Bull Rally. Originally from Pernambuco your host Carmen has been a native of the Lençóis for 12 years working mostly as a tour guide with the leading travel agencies in the region. She speaks Portuguese, English and French. Carmen is supported by Olaf, who washed up in Atins about 10 years ago and fulfilled himself a life-long dream in building a little holiday refuge named Convento Arcádia. He is also looking after the villages tourism portal Atins.me and is a founding member of Atins Sustentável, a local non-profit. Olaf lives in Rio and London and speaks German, English and Portuguese. Been to Atins? What did you think? Where are the Best Kitesurfing Beaches in Atins? There are two dedicated launch spots on Atins beach which give you access to a huge lagoon, which essentially represents the mouth of the River Preguiças. The ever-changing sandbanks make for a diverse and entertaining as well as sublime warm flat water conditions. Perfect conditions for all levels of riders from beginners to freestylers. If you're into waves sail out to the ocean and enjoy the chop and waves there. And if you're into more adventure why not continue downwind along the endless beaches of the Lençóis Maranhenses? When is the Best Time to go Kitesurfing in Atins?